Category Archives for "Gas Grills"
Outdoor kitchens can be a great addition to an existing home, or an interesting development in one being built. Typically built in areas of nicer weather year-round, they can be built anywhere a person loves barbecue, grilling or cooking and entertaining outdoors. The first consideration in building an outdoor kitchen is whether or not you will continue to cook outdoors to justify the expense. In all honesty, if you like grilling and do it a few times a month, it really will end up being a big waste of money. Outdoor kitchens are not cheap, beginning at around 5,000 dollars on the low end and running up into 50,000 dollars and beyond for the extravagant ones. If you enjoy cooking outdoors and want to build something, maybe a nice deck with a new barbecue would be the best choice. Cheaper than a full outdoor kitchen, the deck could add value to your home and be the starting point if, a couple years down the road, you decide you really do want to build an outdoor kitchen. However, if you realize that you are barbecuing and grilling several times a week or more all summer long, try to grill as much as the weather will allow during the spring and fall, and even brave the cold weather for a few barbecues during the winter, an outdoor kitchen might be just the right addition to your home. Although adapted from the Mediterranean region of Europe, they can be built in any part of the country where people love cooking and entertaining outdoors. At its most basic, outdoor kitchens are a place to grill with a place to store the stuff you use when grilling. Of course, just this small definition could be used to spend a lot of money if you go all out. Functional and serviceable outdoor grills for permanent installation can be found in the 500 to 1,000 dollar range, but it doesn’t take much to find them ranging up in the 5,000 dollar range, or even more. Add in some custom counter space and cabinets and you’re talking about a 10,000 outdoor kitchen – one that has just a grill and nothing more. Add a refrigerator, a sink, more storage, table and chairs, a pergola, some more outdoor kitchen appliances, maybe some custom lighting, and soon, you’re in the 30,000 dollar plus range. However, if you stick to the less expensive grills, don’t opt for custom cabinets, find your outdoor kitchen plans for free on the internet, do some of the work yourself, choose things that are on sale, and realize that you don’t have to build the entire thing at once, your costs will be much lower. Most projections for lower-end outdoor kitchens will come in around 3,000 dollars, however, in reality, 5,000 dollars is a more realistic budget. Buying used equipment and having friends help with the work can bring these estimates down somewhat. Just make sure to do everything by the book and up to code for your area. One of the great things about outdoor kitchens is their ability to add value to the house if and when you decide to sell. A hastily slapped together one with multiple code violations and safety hazards will do the opposite. Outdoor kitchens can be great as centers for not only cooking delicious food, but wonderful memories of time spent with family and friends as well. If you really think an outdoor kitchen is right for you, take some time to look around on the Internet for outdoor kitchen plans and outdoor kitchen ideas before jumping in with both feet. Talk to people you might know who already have outdoor kitchens to gauge their feelings. We here at Love That Barbecue love outdoor kitchens. They are great social and culinary hubs for the family. However, they are not right for everyone and every location. We hate to see people spend a bunch of money on something that isn’t a good fit for themselves or their situations. So take a good hard look at your personal situation before going too far and building an outdoor kitchen when you may not really need or want one. You might save yourself a lot of frustration and expense in the long run. However, if after exploring outdoor kitchens, you truly think that is exactly what you need to do, then have at it. Our experiences with outdoor kitchens have been overwhelmingly positive and the people we know who have built them after much consideration absolutely love them and wouldn’t consider living without them. So you’ve got your new Weber grill and you’ve got your new grill accessories and you’re ready for everything. You’re ready to start cooking and making some great food and great memories. But do you have your grill cover. Wait, you didn’t buy a Weber grill cover? Well, you need to, and sooner rather than later. A Weber grill cover is exactly what it sounds like – it is a cover for your Weber grill, whether gas grill or charcoal grill, it doesn’t matter, you need to get a bbq cover for it. Why? Think of all the rain. And snow. And ice. And dew. And humidity. And bird droppings. And insect droppings. And slug trails. And snail trails. And every bit of wet thing falling on your beautiful fire-offering and food-giving grill. Slowly and irrevocable damaging and eating away at your grill. Piece by piece by piece. Get the picture? Stainless steel rusts. Aluminum corrodes. Unless you have a grill made from either gold or titanium you need to be getting a grill cover for it. So you’re sold, a grill cover is in your near future. What do you buy? Well, if you have a Weber gas grill, then we highly recommend getting a Weber grill cover. Made for your grill and most likely your grill alone. It will fit better and be easier to get off and on than grill covers from other manufacturers. The only possible exception is for the Weber grill covers that have ventilation holes in them or have cut-outs for the sides or trays. The entire purpose of grill covers is to protect the grill inside and that cannot be done if there are holes or ways for water or the elements to get inside. If the grill cover that Weber offers for your model of grill comes with ventilation holes or cut-outs, and honestly not many do, it would be best to avoid them. But if you don’t get a Weber grill cover, what do you buy? Well, you can go with the generic, ill-fitting option, you can go even worse and just use a tarp, or you can go the best route and buy yourself a custom-made grill cover. A custom grill cover? Surely that’s expensive, isn’t it? Not as much as you might think. Of course you can find expensive ones, but there are reasonably priced ones available. For example, Mel over at Mel’s BBQ Grill Covers sells a variety of grill covers that come in generic sizes that run from small for a grill 50 inches wide, 41 inches tall and 24 inches deep up to the large which runs 78 inches wide by 60 inches tall and 28 inches deep. Prices depend on size and, oddly enough, color with black being the most expensive and gray and sandstone being the same price. How much different? About 15 dollars regardless of size. The small black one is 50 bucks while the small grey or sandstone is 37. Honestly, the Love That Barbecue staff appreciates the color options and would buy either the grey or the sandstone over the black. Also, shipping runs 15 bucks, although these things are heavy, some as much as 20 pounds, so it’s not unreasonable. In fact, these aren’t all that much more expensive than the bbq covers that Weber makes. I bet if you contact Mel he’d make a custom fitting one for your personal grill. Just a hunch, though. If you’ve bothered to spend any money at all on your Weber gas grill or charcoal grill, then you owe it to yourself to buy a Weber grill cover. You just need to get something over your grill to keep it safe and functioning. If you love that barbecue, you’ll cover it up. What Is An Outdoor Kitchen; Do You Really Need One And How Much Do They Cost? If you live in an area with great weather most of the year or you find yourself cooking outdoors more and more during the nice weather that you do have, you might consider upgrading your grilling situation to an outdoor kitchen. While the super deluxe ones come with super deluxe prices, an outdoor kitchen doesn’t have to be terribly expensive. But why would someone build an outdoor kitchen in the first place? Take a minute to think about the time you spend grilling. If you find yourself grilling more and more, perhaps spending half of your dinners a week at the grill, it might be time to think of upgrading from just a grill on the patio to a full-on outdoor kitchen. Having an outdoor kitchen will save quite a bit on time spent going between the kitchen and the grill and allow a more enjoyable experience outdoors. If you are already thinking about buying a new gas grill anyway, it is the absolute perfect time to explore the world of outdoor kitchens. An outdoor kitchen at its most basic is a grill, some counter space with some storage beneath them. In fact, an outdoor kitchen does not have to be a permanent installation. There are portable outdoor kitchens which combine a nice grill with some storage underneath and some “counters” to either side of the grill. By portable they really mean rollable as that’s about all they can really do – be rolled from one area to another. Sure, they perform their function well, and they are great for those who decide on them, but in the fine opinion of the Love That Barbecue staff, they’re kind of neither here nor there. A good grill, sure, but calling them an outdoor kitchen is a bit of a stretch. And with nicer ones going for around the 1,500 – 2,000 dollar range, they are approaching the modest or budget outdoor kitchen installations. If you’re looking for a nice grill that rolls, keep them in mind. But if you’re looking for an outdoor kitchen, go the extra mile, spend a little more, and get the real thing. So how much does an outdoor kitchen cost? Most budget ones will start at around 3,000 dollars. You can get them done for less if you do some of the work yourself or have friends or family who will be willing to help out, but if you’re paying for it to get done, expect 3,000 to be the starting price. Expect to pay around 1,000, plus or minus, for a serviceable gas grill, around 500 or so for a small refrigerator, 100 for a sink, with the balance being spent on countertops, cabinets, plumbing, electricity, and gas lines being installed. Mind, you, these prices won’t get you top of the line. What you will get for your 3,000 – 5,000 dollars will be a great outdoor kitchen that will be serviceable for some time. If you’re willing to spend more, going up to around 15,000 dollars, you will get much more. Some people spend 50,000 plus on a fully decked out outdoor kitchen complete with wood-burning oven, custom outdoor kitchen plans and construction. If your days and nights are beginning to be filled with outdoor kitchen ideas and you’re starting to search for outdoor kitchen appliances on the internet at work, do yourself a favor and seriously look into one. That includes evaluating how much nice weather you will be able to spend at your outdoor kitchen and whether or not the whole family will want to join you in eating outside all the time. Outdoor kitchens can be great additions to the house, but like many expensive household expenditures, they could also end up being time-wasting money pits that never get used. Plan for your new outdoor kitchen wisely and you will enjoy it all the more. No joke – electric grills have come a long way in the past five or ten years. Gone are the days of them being nothing more than a glorified frying pan… with bars. If you absolutely cannot use a gas or charcoal grill to satisfy your grilling desires, then fear not. A modern electric grill can be expected to do a pretty decent job of grilling up a meal for you and yours. Now, don’t get us wrong. In a head-to-head competition, gas or charcoal grills win on sheer firepower alone. Not to mention the authentic taste electric grills sometimes lack. But if you absolutely positively cannot use an open flame in your situation? The days of electric grills being unable to cook a decent meal are long gone. Let’s take a look at what we’re talking about. While many people are going to focus on the cons of electric grills, we here at LTB believe in giving things a fair shake. We’re going to look at the pros first and finish up with the cons. Few restrictions: for many people electric is the only choice. Apartment or condo rules prohibit or restrict what many people can do. In these cases, an electric grill can be the only viable choice. Well, you could always not grill, but come on – that’s not really a choice at all, is it? Can be difficult to get enough heat to cook well on. How much heat it generates is going to be a function of design more than anything. Check out the overviews of some of the better electric grills listed above. Heating up can take some time. If you’re used to the near-instant cooking of gas, this can be frustrating. Not so much if coming from a charcoal background. Cooking times can, well, take some time. We don’t want to beat a dead horse, here. Rather we want you to know what you’re getting into. Don’t expect authentic grilled flavor. Somewhere between a little and a lot of the flavor of food cooked on gas or charcoal comes from the heat and flame. While some of these little electric devils pump out an impressive amount of heat, the flame just doesn’t exist. Unlikely to be doing any cedar plank grilling, but come on, you knew that already, right? Now, don’t let the greater number of cons scare you. That single solitary “pro” at the top of the list can outweigh all of the cons. It’s simple – if gas or charcoal grills are out of the question then you’ve gotta go electric. Luckily we live in a day and age where good quality electric grills are plentiful and reasonably priced. So stop hemming and hawing and go out there and find yourself a fine electric grill. Because if you Love That Barbecue, it’s what you’ve gotta do. If you’re looking for an electric grill for outdoors, you’re in luck. Most of the models made today are designed to be used outdoors. That doesn’t mean you can use them in a downpour or in soaking wet grass. It does mean, however, that with a long enough extension cord and some common sense you can grill up a nice meal in places where gas and charcoal grills aren’t allowed. Think verandas or patios in apartment buildings and condos. Or outside football games or really dry areas in the middle of summer. So which is our pick for the best outdoor electric grill? Weber is one of the biggest names in grilling, so when they put together an electric grill, you can bet it’s going to be put together correctly. The Q2400 claims to get up to 600 degrees under the hood – more than enough to cook up whatever you want to cook. Sizewise, it’s not that bad. It’s got double the grilling area of a Smokey Joe and there’s no charcoal ash to clean up. Plus, it’ll fit in the trunk of your car without taking up the whole trunk. How does it grill? People have reported being able to throw down a number of steaks and other grillables on the porcelain-enameled cast-iron premium grates. The lid is reasonably tall, allowing you to shove something larger than a thick burger or chicken breast under it. Keep in mind it takes about 20 minutes to heat up to cooking temps. And the more you open it, the longer the cooking will take. Searing is going to be a mixed bag – some people have good luck, some people say no go. Add in the Weber Portable Cart and you’ve got yourself a real decent setup. The cart raises it up and turn it into an approximation of a full size grill. Well, full size but smaller. There’s also a cover available for the whole thing. If you’re looking for something a little smaller (or cheaper) the Q1400 is basically the same grill, minus about 100 square inches of grilling area and about 50 bucks. Both come with a six-foot cord. Solid grill, solid design, solid company. Possible to sear if you do things right. That domed hood gives you some room to play with. Low design requires cart or table to make cooking comfortable. On the spendy side for an electric grill. We like the Weber Q2400. Although we don’t need an electric grill, we like it so much we’re considering moving to a condo just so we’ll have to buy it. Okay, maybe not that much, but it’s a seriously awesome grill. If we needed an electric grill, this would be our top choice. No desire, possibility or plans to grill outdoors? Then you’re looking for an indoor electric grill, and we’ve got you covered. What makes an indoor grill? Primarily it will be covered heating elements. In order to get things going faster and hotter, many outdoor grills will have exposed heating elements. When cooking, juices of the item being cooked drip onto the elements, burning and smoking as they go. Not so with the Zojirushi EB-CC15 Indoor Electric Grill. Its heating elements are entirely protected from the cooking surface. While this may cut down on the ability to sear or really cook items as well as some of the outdoor-only powerhouses, it will also dramatically cut down on the amount of smoke created when cooking. This grill bills itself as an indoor electric grill and it passes. 12.5 by 9.25 cooking surface isn’t gigantic, but it’s not meant to be. It’s meant to cook well for a few people. Or those eating in shifts. It’s not porcelain or porcelain-coated, but still comes with a non-stick surface that earns good marks. In fact, the little Zojirushi gets high marks in reviews everywhere I’ve found it for sale. If you want to grill something indoors and fill the house with wonderful smells (not carbon monoxide) then an indoor grill is your end goal – and the Zojirushi EB-CC15 is our top choice. Non-stick surface makes cooking and cleanup a breeze. While it won’t win sear contests, it’ll cook most things just fine. Metal utensils will ruin non-stick coating lickety-split. No lid so no convection cooking. Only three settings: low, medium and high. All in all, the Zojirushi is our top choice for an indoor electric grill. However, if you’re looking for a grill with a lid to both cook thicker foods convectionally as well as cut down on the mess of grilling with an open-top grill, take a look at the Secura GR-1503XL. It’s got a lid plus a reversible cooking surface, allowing it to go from grill to griddle easily. Sometimes you feel like an outdoor cookout. Sometimes you just want to relax inside and enjoy cooking in the peace and quiet of your own home. Is the only option to buy an indoor and an outdoor grill? 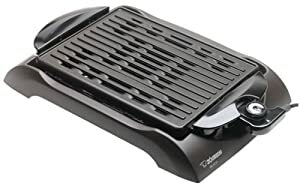 If you’re in the market for an indoor and outdoor electric grill, you’d best take a good hard look at the George Foreman GGR50B Indoor/Outdoor Grill. It’s kinda got all the bases covered. Tabletop grilling ability? Check. Removable pedestal for outdoor ease? Check. Reasonable price? Check. Thousands of complimentary reviews? Check. It does it all, right? Kinda. The biggest drawback is the unit is a little top-heavy when mounted on the pedestal. Just looking at it and you can see that you might want to be a little careful with bumping into it. Other than that, the reports are in line with most electric grills – does a great job if you know the limitations of the unit. Also, be aware that the pan to collect grease drippings is under the surface of the grill. Meaning that you’ll need to wait until the grill cools to remove and clean the grease tray. The domed lid lets air move around a little more. Drip tray keeps things neater and cleaner. Comes with a pedestal to raise it up to a reasonable height for outdoor grilling. Top heavy – not for heavy traffic or areas with active young ones or pets. Positioning of drip tray not optimum. Getting char marks is more hit and miss than anything. The George Foreman GGR50B is an excellent choice if you’re looking to bridge the gap between indoors and outdoors. It’ll do fine on top of a table or a kitchen island inside or on the pedestal outside. Just make sure to use it away from rowdy people (or pets) and you’ll go far. Most electric grills are, by definition, portable. They’re not that big and if you have a long enough extension cord, you can take it anywhere. 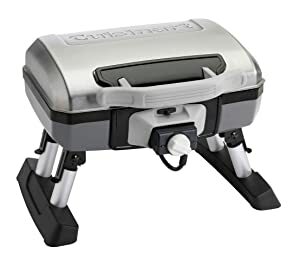 But a portable electric grill is designed to be packed up and carried, and in the realm of portable electric grills, the Cuisinart Outdoor Electric Grill. Although we discuss the Tabletop model here, they do offer one with longer legs that will raise up the unit to approximately waist-high. The tradeoff? Bulkier to carry and store. Whether you choose the Tabletop version or go with the Versistand model, you’ll be getting a good grill that is designed to be transported. Oh, and it can cook a mean steak. One thing to keep in mind – the Cuisinart is smaller. That’s the tradeoff of a portable outdoor electric grill – it’s not going to feed an army. Smaller groups or shift eating are key here. While they claim 8 burgers or 8 steaks or 6-10 chicken breasts, etc. those aren’t huge burgers. Or steaks. Or breasts. We’re just sayin’ – 145 square inches isn’t going to get you eight big burgers. But also keep in mind – that smaller size makes it more portable. Wanna know how much trunk space a Weber Smokey Joe takes up? More than you can imagine. The Cuisinart Outdoor Electric grill? Far, far less. Can cook up a mean grilled meal. Quality can be hit or miss. That size – make sure you can live with it or send it back. If portable is your main concern when buying an electric grill, then the Cuisinart should be near the top of your list. It’s designed to be easily portable. Go with the VersiStand or the Tabletop – it’s essentially the same. One has longer legs, one has table top length legs. If you’re looking for something a little bigger and are willing to sacrifice a little portability, then we recommend the Weber Q2400. It’s not as portable, sure, but that tradeoff gives you more cooking area. It also gives you a better-rated grill. Going camping but the facility outlaws all open flames? Found out too late to change the reservations? No worries – an electric grill can solve many of your problems. The best electric grill for your camping situation is going to depend on a variety of factors: storage space in your vehicle, how many people you’re cooking for, the setup at the camping area (tabletop ability or do you need a stand) and the distance to a plugin. All those things aside, the LTB top choice for a non-open flame grill for your camping excursion is the Weber Q2400. Yeah, yeah, we know. We put it in the Best Outdoor Grill spot above. I hear you. But the same outstanding features and capabilities that put it in the top spot for best outdoor electric grill mean it’s going to get top marks for a camping unit as well. The only drawback? Size and, well, size. The size of the Q2400 means it’s going to eat up trunk space. If you’re dead set on having a grill, you might want to do a trial packing run before your trip. On the flip side is this – while the Weber Q2400 is large for an electric grill, in the overall scheme of things, it’s really not that big of a grill. If you’re cooking for a whole lot of people, you might want to do a trial cooking run. Or buy two. Yeah, crazy as it sounds, if you’re camping in a place that forbids open flames, have a lot of people to cook for, and just have to have grilled food, then two of the Weber Q2400 units might be a good plan. But if you’re doing that, make sure there’s a stable surface to cook them on, preferably waist high. Because while those Weber carts are nice, if you’re doing that much grilling, you’re gonna need more prep space and cooking space. A solid grill that will outperform most other plug-ins. The size and domed hood let you do more than just hot dogs and hamburgers. Although why would you really want to? Bigger than most other portable electric grills. If you’re looking for cheap, you’ll need to look elsewhere. The Weber Q2400 is top choice as both the best outdoor electric grill and the best electric camping grill for a reason. It’s just that good. While it is expensive, you get what you pay for. What you’re paying for is a top-notch grill that will take what you throw at it and spit back awesome food. Tailgating – an American tradition almost as old as football. Okay, not that old, but you get the picture. When you’re thinking of that picture, you’re likely thinking of three things – good times with friends, alcohol, and grilling. And you’d be right. The smoke rising from grills can smell fantastic outside a stadium. Unfortunately, like many camping areas, stadiums are increasingly shutting down the old dream of tailgating. Limits on open flames in the parking lots of stadiums are increasingly common. Sure, it’s safer. But the stadiums would rather have you inside, spending money on concessions instead of grilling up a magnificently tender and juicy burger in their parking lot with your pals. While an electric grill may not be able to stand toe-to-toe with its charcoal or gas-powered cousins, you can come close. And to come close you’re gonna need power. As much as you can muster in as reasonable a package as you can find. The Weber Q2400 gets our vote as the best electric grill for tailgating. Of course, if you can use gas, then there are a wide range of portable gas grills that would make great tailgating grills. But if you’re confined to electric, then you’d best look long and hard at the Weber Q2400. Oh, and just get the cart. You’ll kick yourself the first time you try to use it on an actual tailgate. It’s a Web—all right, we’ve beat that to death. It’s a damn fine grill. Get thee behind me, Satan. Best Outdoor Electric Grill, Best Electric Grill for Camping AND Best Electric Grill for Tailgating? It’s a three-peat. For a reason. Okay, not that serious, but a smokeless indoor grill is going to be exactly what you want when you’re looking to cook up some fine grilled meat. Keep in mind, though, smokeless isn’t actually smokeless. More like reduced smoke than anything. How does it work? Simple – what causes smoke on a grill? Fire. Second? Moisture, meat and drippings hitting the heat source. While some grills have exposed heating elements (looking at you, Mr. Q2400), smokeless grills will have heating elements that are protected by the grill surface itself. As the food cooks, the moisture and drippings it creates are channeled through various means into a drip pan, which is then cleaned up after the meal is finished. Some companies get fancy and try various methods to actually get a smokeless grill. But truth be told, if you’ve gone to the trouble to get a relatively smokeless grill, you’ve probably already gone far enough. Most smokeless indoor electric grills will satisfy the average consumer. 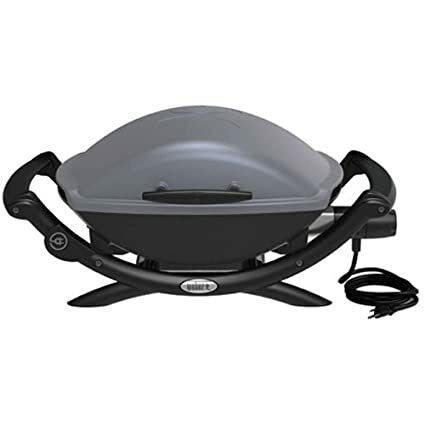 For example, our best pick for indoor electric grill, the Zojirushi EB-CC15 Indoor Electric Grill does a great job, but like most indoor electric grills, it will produce a little smoke. Not a lot, a little. But it’s a stretch to call it smokeless. Likewise the equally popular Livart Orange grill is a good choice if you want to do Asian style cooking (Japanese and Korean barbecue come to mind). Although, truth be told, the Zojirushi would work just as fine in this aspect. But all these choices will smoke a certain amount. If you’re looking for a an indoor electric grill that can sear a steak yet produce the absolute minimal amount of smoke, you’re going to need the Philips HD6371/94 Indoor Smokeless Infrared Grill. It’s unique heating element utilizes infrared technology to heat the grill rack to 446 degrees. The heating elements are out from under the grill and utilizing technology and a fair bit of wizardry (heat reflectors), the heat from the elements is redirected from the sides of the grill to the grill itself. Underneath is a drip pan that, free from the heat associated with the heating elements, allows the fat and moisture to drip down without sizzling and burning. Again, nothing is smokeless in the world of the grill. You’re cooking meat and there will be smoke in some form or another. 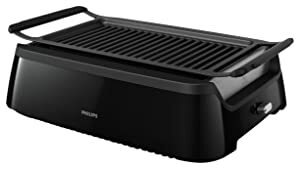 But the Philips Indoor Smokeless Grill is about as close as your going to come unless you’ve got a ventilation unit. But it comes at a price. It runs 3-6 times the prices of other indoor smokeless electric grills. But keep in mind, those grills are unlikely to sear a steak. Infrared technology can sear your steak. No metaphor there. Claims to be 80% less smoke than conventional grilling. One speed – full out. No chance of turning things to a more reasonable level. If you’re looking for a smokeless indoor electric grill and have a bit of coin to spend, the Philips HD6371/94 Indoor Smokeless Infrared grill is the one you should be looking at. Keep in mind that everything is going to smoke a little, plus the infrared cooking technology can take a little getting used to. Other than that, enjoy your grilling, oh indoor wizard. Okay, the fine folks here at LTB are not scientists. That said, infrared grills are a little unique in the world of grilling. Essentially, with a regular grill, the hot gas or rising heat from the coals will cook the food on the grill. However, with infrared cooking, it’s not that easy. What happens is the heat source (usually electric or gas) heats a metal or ceramic plate. The heat from that unit radiates up and cooks the meat. But don’t think you can just plunk a piece of metal between the flame and the grill and you’re infrared. The science behind it means that not just heat, but heat in the infrared range of the spectrum is involved in the cooking as well. Again, not scientists here. But with more and more companies coming out with infrared grills, there’s got to be something to it. We’ve tried infrared grills with varying levels of success and are intrigued. Some of our friends swear by infrared cooking. Thus comes the Char-Broil TRU-Infrared Patio Bistro Electric Grill. At 240 sq inches, it has a little less primary grilling space than the venerable Weber Q 2400. However the Charbroil adds in an 80 sq inch warming rack. The lid is highly domed, allowing you to possibly stuff something birdish or at least decent sized under it. If you don’t like or need the stand, Charbroil offers a tabletop version called the Char-Broil TRU Infrared Patio Bistro 180 Electric Grill. There’s another version of the standard Patio Bistro that has dual folding side shelves. And don’t forget the fact that most versions come in up to six different colors. Including a lovely Moss Green. Nice compact grill with a stable base that you don’t have to bend over to cook on. Infrared tech is an interesting way of grilling. Color choices beyond black or red. If you hate infrared grilling, keep walking. If you love infrared cooking or want to give it a shot, the CharBroil TRU infrared Patio Bistro is a good-looking, well-constructed grill that looks at home on most patios. It’s stylish and can cook decent food without the need for gas or open flames. But learning the ropes of cooking with infrared can take a little time and it’s not everyone’s cup of tea. It’s a fair guess the majority of people looking to buy an electric grill are doing so because of their living situation. Many apartments or condos do not allow open flames or gas grills. But humankind’s love affair with grilled meat cannot be quelled. Neither can humankind’s need to have nice-looking stuff. Many of the electric grills leave a little something to be desired in the looks department. I’m not pointing fingers, but why design and sell something that looks like a grill sold back in the seventies? And no, we’re not talking about Webers here. Luckily for the person who has a higher sense of design and asthetics, the Fire Magic E250s is available and it is one handsome looking stainless steel patio grill. Now, we’ll get this out of the way up front – it’s not cheap. But Fire Magic makes decent grills, and you wouldn’t want a cheap stainless steel grill anyway. Cheap stainless steel may be stainless steel, but it’s also cheap and unlikely to last very long without a lot of babying. Not so the Fire Magic E250s. 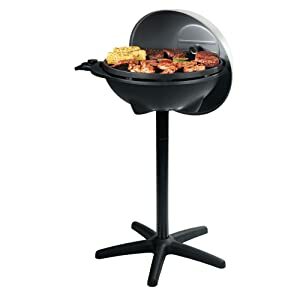 The wide base provides a fair measure of stability, much greater than a number of electric grills on the market today. The pedestal is well-constructed, looks nice and isn’t cheesy. But all that doesn’t matter if it doesn’t do the deed of grilling. Which the Fire Magic does. How does 725 degrees of firey goodness under the hood sound? Sounds hotter than a…well, make up your own joke here, but it’s hot. One drawback? Like most electric grills, the Fire Magic E250s has one burner. Meaning turning off part of the grill to get some convection heating going is unlikely to happen. Okay, it’s not going to happen. If you don’t mind grilling everything with direct heat, then you’re golden. Otherwise, you might want to think twice. Especially since this grill isn’t anywhere close to cheap. 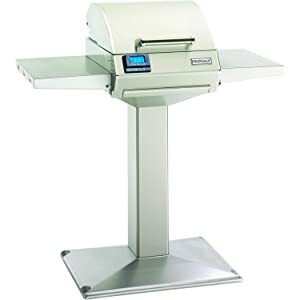 And should you ever need, there is a rotisserie attachment available, as well as replacement pedestal and shelves set. Which, while I hope none of my readers will ever need, is nice to know is there. Hot as Hades under the hood. Will look nice on your upscale condo patio. One burner, no chance of convection heating. Thermostat control has reports of being finicky. Expensive grill, but gobs of gorgeous stainless steel so you can leave it outside without stressing too much. Just don’t think stainless steel is magical – it will rust if you neglect it too much. Come on, you had to see that coming. Coupled with the cart, the Weber makes an excellent all-around grill for the times when you need an electric grill. It isn’t as pretty as the Fire Magic, isn’t as portable as the Cuisinart and it sure ain’t as smokeless as the Philips. But for an electric grill, it’s probably as close to perfect for most situations as you can get. Sure, it’s a little on the spendy side. But here, you really are getting what you are paying for. You just might find the awesomest grill for what you need. Barbecuing is a popular national pastime here in the United States, and around the world. All over the world, people love to barbecue. It may not be exactly the same style of cooking, the food may be different, the recipes are not going to be the same, but the act of getting around over an open flame and cooking and eating food together is almost universal. The first step to barbecuing is buying a grill. While charcoal grills are still very common and very popular, many people these days love the ease of cooking on gas grills. Especially for larger grill and crowds, gas grills are the only logical choice. But what kind of gas grills should a person be looking at? The first thing to consider is how portable the grill needs to be. Does it need to be put in the back of a pickup truck often or only occasionally? Does it need to be put in the back of a car? Will it only be rolled from the garage to the patio? Or is it not going to be moved at all? Are you looking at buying an outdoor kitchen or something you can grill a hotdog or two at the park with your friends? Answering the question of portability first will help in the decision making process. Once the portability issue is decided, we can move on to the type of gas to be used. No, we’re not talking about gasoline. Virtually all gas grills will run off of either propane or natural gas with propane being the most common for portable grills. For people who have natural gas hookups at their house and don’t plan on moving the grill that much, natural gas may be an option. However, for the large majority of people across these United States, propane gas will be the fuel of choice for their gas grills. It’s not epically important, but it is something that should be decided and asked about before purchasing something that may not fit your circumstance. Once the issue of size, or portability, and the type of gas being used is decided, the rest comes down to features, price and look. Because gas grills use gas, which is far more flammable than charcoal or wood, it would be wise to purchase gas grills from recognized brands and businesses. Going with a no-name brand from a hole in the wall that you’ve never seen before could be a recipe for trouble. Buy from an established business, whether in your local area or on the internet. Also, try to purchase one of the better-known brands. This won’t insure that you will purchase a quality gas grill, but it will help you on the road to a quality gas grill that you can enjoy for many years to come. Although not of huge importance, be sure you look into grill covers, grill accessories and maybe even a grill set when you are shopping for gas grills. You may have some left over from your previous gas grill, and if you are happy with them, then great. However, some gas grills require specialized tools, so don’t be shy about buying the right accessories for them when you buy the grill. You’ll be glad you did in the long run. It doesn’t really matter if you buy charcoal grills or gas grills. We here at Love That Barbecue think both are good in different situations. But just make sure that whatever you buy, you don’t go overboard on the price. Make a budget and stick to it. Buying a new gas grill shouldn’t be a painful experience. Just think of all the cookouts you’ll be having for years to come.